The second generation of Endura's FS260 Pro SL Bib Shorts, scientifically developed to provide complete comfort. Featuring a 700 series pad which pushes the boundaries of both comfort and performance. ATTENTION: Please note these are Medium Pad. Please see size guide for more information regarding the fit of this pad. Boosting a classic into the quality stratosphere, the newly updated Pro SL Bib Shorts with a Medium Pad from Endura is every bit as good as before but with a cleaner and more contemporary aesthetic. The Lycra fabric used here is of an exceptional Italian standard with plenty of comfort in all the right places. On top of that, the Pro SL II features Coldblack® technology to keep your body’s core temperature just right. It does this by reflecting both UV and infrared sunlight away from the fabric rather than absorbing it, while also providing reliable protection against harmful rays to a minimum of factor 30. Meanwhile, in the heart of the shorts section sits the legendary 700 Series Pad. With semi-custom fit and available exclusively in Endura’s FS260 Pro SL bibshorts, this Continuously Variable Profile (CVP) pad has been scientifically developed to provide different width options that match varying seat bone widths. It is offered in two sizes with each available in three widths to allow a near perfect body match based on the rider’s body geometry and riding position. Featuring the same high stretch, antibacterial microfiber face fabric and fast breathing stretch open cell foam as their 800 series pad, the precision fitting of this pad through multiple sizes and widths allows for removal of any excess padding that does not serve a purpose so allowing improved breathability, flexibility and, ultimately, comfort. Particularly well suited for those riders who have already undertaken a bike fit and already know their correct saddle width. Rounding out proceedings are a whole heap of little extras that ensure every ride out is a joy. Raw edge hem bands at the bottom of the shorts keep everything perfectly in place without feeling restrictive, and a laser-cut rear pocket keep those essential items within easy reach at all times. The Pro SL II remains enormously popular with the Movistar team, so isn’t it time you found out just what a difference it can make to your performance? Endura was founded in Scotland in 1993 with a no-nonsense commitment to advancing the performance and function of cycle apparel for all. As a maverick brand, it immediately launched a host of novel and challenging products that have gone on to earn iconic status globally and in many cases reset the benchmark of function and durability for the industry. This philosophy and disruptive innovation has carried the brand from Scottish local hero to global market leader. At Endura they never take the easy route – never complacent, always thinking about the next part of the journey. Three pad width options are offered to ensure the closest match to pelvic geometry and riding style. The pad width is determined by matching sit bone measurement and saddle width to a simple measurement chart or for the most accurate results by being measured using the Endura-gebioMized® PadFit ™ System (patent pending), which goes far beyond other systems by dynamically mapping pressure and matching the short pad for the ultimate all day comfort and fit. 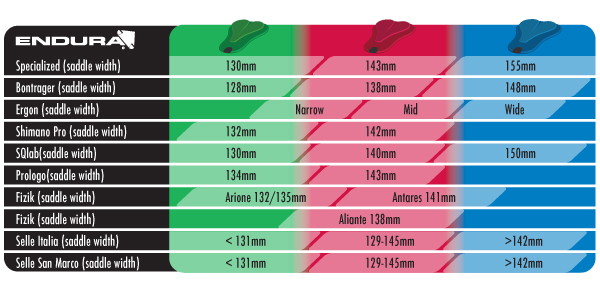 As an approximate guide to corresponding saddle widths, please see below graphic. Endura Pro SL II Bib Shorts (Medium Pad) is rated 4.7 out of 5 by 6. Rated 5 out of 5 by cutting42 from Comfort and great padding My first bib shorts but what a revelation with the built in padding. Great support and comfort, like having a cushion stuffed down your pants. Very high quality of manufacture with fit very good and the leg grippers in particular very effective. Rated 4 out of 5 by mamil63 from Not had shorts from Endura before so took a punt over my usual brand because the price was good . I chose the medium pad because it seemed the best place to start , I just don't get this Idea of matching pad with saddle mine is not on the list given and there are so many other variables to consider . If they fit they fit if not you try something else . Ok so happily these are good for me nice form fit not overly long in the leg look good . I have ridden about 20 hours so think the comfort will be fine pad not too bulky as is my preference . One issue is sewn on labels on the inside which irritate small of my back . Why do they do this ? Also front comes too high up torso making nature breaks more of a struggle than need be . Rated 5 out of 5 by TimC64 from Great fit very comfortable! Having tried a number of other options from budget through to expensive bib shorts, all of which that didn't fit properly. I am 5'11" with short legs and a long back. The Endura bibs are a great fit and comfortable on long rides, I would thoroughly recommend them! Even better they were on sale! Rated 4 out of 5 by Thommo62 from These shorts are very well made and you definitely get what you pay for. The only reason I didn't give 5 stars is the pad.I have a specialized power saddle that is 143mm wide and according to the guide on the Endura web site a medium pad was recommended. I'm not sure if it will take a few more rides to get used to it but I expected it to be more comfortable. I'm a big bloke so maybe I'm overwhelming the pad with my weight.The shorts are an excellent fit and have some quality touches. Are these the long leg version? I can confirm now that I have ordered them the pair I received are the long leg version.